Erastin is a ferroptosis activator. FIN-56 is a specific inducer of ferroptosis. Liproxstatin-1 is a potent ferroptosis inhibitor in cells, in Gpx4(-/-) mice, and in a pre-clinical model of ischaemia/reperfusion-induced hepatic damage. 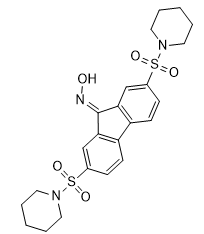 Ferrostatin-1 is a potent inhibitor of ferroptosis with an EC50 of 60 nM. CIL56 is a YAP1 inhibitor. It acts by inducing non-apoptotic cell death, triggering cell death dependent upon the rate-limiting de novo lipid synthetic enzyme ACACA.